Please note, the sale of mist nets is restricted to those with an appropriate licence or permit. Please provide a copy when ordering. Net design is based on more than 30 years experience. All nets are made from the highest quality nylon and polyester netting. All nets are black and UV sun-protected; the material and colours are durable and long-lasting. The special knots used in all our nets help to prevent the loops and shelf strings from moving. The construction with positioning strings prevents wind shift of the netting. Each net comes with a cotton bag. All designs of net have recently been upgraded with new loops. Net loops are now marked with an indelible serial number to help track nets used illegally. The serial number is placed on one of the colour loops and on the product label as well. The new mist net loops are longer and stronger than previous designs. Top loops are colour-coded and equipped with stoppers to make fast setting easier. The new loops are also compatible with the telescopic mist net pole . All net dimensions are given without loops and stretched to a standard tension. Nets of 3m are ideal for paths and small clearings, whilst nets in excess of 15m in length require careful setting. You should also ensure enough competent helpers are on hand to deal with large numbers of catches experienced by large nets. This is measured by one side of the square mesh, e.g. 16mm refers to a 16 x 16mm square mesh. The mesh size should be ideally suited to your chosen target species. If the mesh size is too small, the bat or bird may escape. If the mesh size is too large, the bat or bird may become overly tangled in the net. You also risk catching non-target species. Target species for each net are provided in the product description. The number of shelves (given in the product description) refers to the number of rows of shelves on the net. Nets of up to three shelves are tethered on a single shelf strand to prevent wind bunching the netting. Nets with four or five shelves feature two tethered strands. The denier and ply of a net provide an indication of the thickness, visibility and strength of the net. Denier refers to the weight in grams of 9000 metres of thread. Ply refers to the number of threads of a given denier wound round one another to make the fibre of the net. The smaller the denier and ply, the lighter and thinner the net, e.g. a 70 denier/2 ply net is lighter, less visible, but normally less strong than a 210 denier/3 ply net. However, differing materials can confound this relationship, e.g. polyester is heavier than nylon so the same denier net will be finer in polyester than in nylon. 1. WHAT DO YOU INTEND TO CATCH? Mist Nets for Large Birds: includes medium to big waders, owls, medium to big raptors, medium to big ducks, geese and cormorants. There are several net types to choose between, although not every net type will be found in every group of target individuals. These nearly invisible ultra-thin monofilament nylon nets are perfect for catching the smallest birds (e.g. hummingbirds) and small bat species such as Pipstrellus sp. They are available in two mesh sizes (14 and 20mm). These polyester nets are recommended for catching small bats and birds. They are barely visible and can be used in any habitat, including open areas. The polyester fibre in UV resistant and does not absorb moisture. In the morning or after rain, just shake the net to remove droplets. A well-stretched net has only one layer (no pockets) and bats are less likely to echolocate it than a nylon net. The polyester is also stronger and more durable than nylon. This classic design of net is deep black, UV stable and softer than polyester. They can be used for catching birds and bats in all kinds of habitat, including open areas. They are both popular and effective. These nets are stronger and more durable than the Series 700 mist nets. They are ideal for long term use; they remain as strong and as black as new after 500 days of continuous exposure in the field. They are more visible than the Series 700 nets, so we recommend that they be set in front of trees or bushes to decrease visibility and to increase their effectiveness. They are very safe for birds and effectively catch small to medium-sized species. These nets are very strong and durable and are primarily designed to catch relatively big birds. They are more visible than the Series 700 and 1000 nets so are most effective when used in shadow when the netting is less visible. 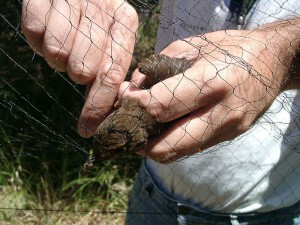 The 19mm mesh size nets are most suited to catching birds at night, such as when using recorded calls. Once you’ve settled on your chosen net type to catch your target species, you should then consider the dimensions of the net. The mesh size should be ideally suited to the target species (see above). The length of the net should suit its location (e.g. path, clearing, open habitat) and the size of catch required. Make sure there are helpers to properly monitor the whole net. Consider the height of the net and number of shelves, the type and height of the vegetation in your sample area, as well as light conditions. Finally, ensure the net is erected properly on suitable poles, such as the telescopic mist net pole. Nets may stretch over time so if left in place for prolonged periods, they must be tightened to keep the net taut. Ensure the nets are protected from overstretching – using a Mounting Set with rubber rope can help prevent this. If you require any further information then please contact us. Mist nets are for use by trained ringers; you will need to supply a copy of your appropriate licence or permit when ordering. We would like to create a mist net for wood pecker sampling. We have a mist net with mesh 32 mm. What type would you recommend for 40g terns?